Home Breed Information Akita Lab Mix: Great Guard Dog or Fabulous Family Pet? Welcome to your complete guide to the Akita Lab mix, sometimes referred to as the “Labrakita”! This hybrid combines two working breeds, one of which is a waterfowl retriever and the other a hunter of large game and devout protector. As such, Akita Lab mixes may be all about business, with an extremely loyal disposition toward their family, or they may be overflowing with friendliness toward most people, with only a slight affinity for sniffing after wild things. Due to their potential to have a high prey drive and/or an aggressive nature toward other animals and strangers, the Akita Lab mix may not be right for everyone. 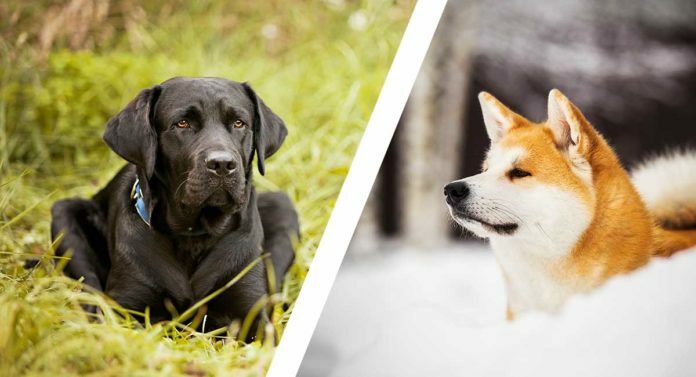 In this article, we’ll find out more about the Akita and Labrador breeds, including their physical and temperamental differences, what the Akita Lab cross may look and act like, and whether or not this cross would be a good choice for you. What Is an Akita Lab Mix? The Labrakita dog is the result of crossing a purebred Labrador retriever with a purebred Akita. The cross produces a large and big-boned dog with a thick double coat. A thick tail that may or may not curl like the Akita’s; and ears that may look like shorter (but still folded) Labrador ears, or they may remain upright. The cross may also have the Akita’s markings, or it may be solid-colored like a traditional Labrador. Let’s learn more about where the Akita mix Labrador came from. Where Did the Akita Lab Mix Come From? The Akita was first developed in 17th century northern Japan, on the island of Honshu, where the Akita’s ancestors were hunting dogs. These dogs were continuously bred with larger breeds, like the Great Dane, to enable them to track and hunt intimidating game such as wild boar, bears and deer. Over the years, the Akita became a treasured and loyal companion, often used as a guard dog and protector of land and master. Unfortunately, the breed almost went extinct, with caused Japan to launch an extensive reformation in the early 1920s. Fortunately, the population of Akitas increased during and after World War II. After WWII, many soldiers returning from Japan brought Akitas home with them, and the breed’s popularity soared. The Labrador retriever hails from much further away, in Newfoundland, Canada. There, in the early 1800s, the Lab’s ancestors dogs were used as waterfowl retrievers. Generations of crossing these retrievers with Newfoundlands produced much larger and stockier dogs that more closely resembled today’s Labrador. 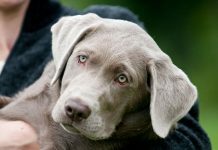 Eventually, the Lab as we know it today came to America, where the AKC accepted the breed as a member of its sporting group in 1917. Make no mistake, Labradors are still prized hunting dogs, but they are most commonly used now as beloved family pets. Due to its lineage, an Akita Lab mix can have one of two very different personality types, or it may have traits from each type. With a mixed breed dog, it’s hard to predict their temperament. There’s a chance that they can act more like one parent than the other, or they may have a mix of their parents’ temperaments. Akitas have a tendency to be standoffish and potentially aggressive toward unfamiliar people, and they can also be territorial around other dogs. They are very protective of their family and will not hesitate to make their presence known if they feel that their home is threatened. Furthermore, with their hunting background, Akitas also tend to chase after small animals, including other household pets like cats. Therefore, if a Labrakita takes after its Akita parent, then you won’t be able to keep him with another dog in the same house. If you entertain lots of guests in your house, then this will not be a good dog for that environment, either. A bit of socializing can go a long way with any dog, and it’s vitally important that an Akita or Akita mix gets plenty of that from a young age in order to prevent or lessen their aggressive instinct. On the other side of the coin, most Labradors are generally outgoing and don’t know a stranger (most, but not all). In fact, they can get a little too excited to see new faces, so a Labrakita with a Lab’s love for everyone could use some obedience training to help him to be less excitable and prone to jumping up. They are usually fine with other dogs in the house, but they may also want to chase after smaller animals. Unlike the Akita, Labs are not independent. They thrive on time spent with their owners and become anxious when left alone for too long. Anxiety in a Lab can come out in the form of chewing—a Labrador’s powerful jaws can make it through pretty much anything. Some unwieldy dog toys and having more than one dog will help to keep a Lab satisfied when you’re not there. It would also be a good idea to do some crate training, in case he’ll need to be put up while you’re away. When left to their own devices, Labs can be rather destructive. Similarly to Akitas, Labs may be tempted to chase after anything that they get a whiff of while out in the yard or in public. If a Labrakita has English Lab breeding, though, then they may not have as strong of a prey drive. With all of the above being said, this will not be a dog that can spend much time off the leash, regardless of which parent they more closely resemble. 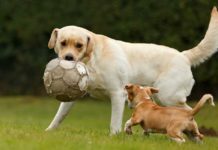 Finally, Labs and Akitas both tend to be good with children, but it’s recommended that you supervise play time between your children and this large, usually but not always patient dog. The Labrakita will be a formidable dog, regardless of whether he inherits his Labrador or Akita parent’s size. Just how formidable he will be, though, depends on whether he’ll be more Lab-sized than Akita-sized. Based on the Lab and Akita’s standard heights and weights, an Akita Lab mix may reach 21.5 to 28 inches tall at the withers and 55 to 130 pounds, with individuals closer in Lab size staying on the smaller end of each spectrum. An Akita black Lab may resemble a Lab, an Akita, or they may look equal parts Lab and Akita. 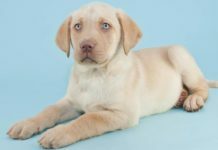 Labs also come in dilute color formations, but these are far more rare. Additionally, a Labrakita may have black, pinto and/or white markings, with or without a mask. An Akita Lab will always have a double coat, which may or may not be waterproof like a Lab’s, and the coat sheds heavily twice a year. A weekly brushing will help keep the hair shedding to a minimum and make sure his coat is shiny. All dogs, regardless of their breed, may develop health problems as they age. Common health problems include hip and elbow dysplasia, hearing and vision loss, and excessive weight gain, to name a few. However, mixed breeds may also inherit any health problems that their parent breeds are susceptible to because of their genetics. 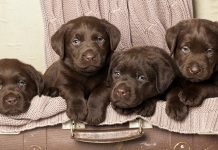 To learn more about the diseases and health conditions that Labrador retrievers are predisposed to, check out our article about Labrador retrievers. To learn more about the diseases and health conditions that Akitas are predisposed to, check out another one of our articles about Akitas. Due to their size and working personalities, Labrakitas need at least a daily walk, but preferably plenty of self-exercise in a fenced-in yard. It will probably be in your best interest to not take this breed to the dog park, given their prey drive and possible aggressive tendencies toward other dogs. Without plenty of activity, this breed has the potential to become depressed and destructive. Giving a Labrakita some purpose will help to prevent this. Some things they may enjoy include fetch, going for runs or long walks, and even swimming and water games. How Long Will an Akita Lab Mix Live? You can expect an Akita Lab mix to live for about 10 to 13 years. Before you look at Akita Lab puppies at a breeder’s, it’s essential that you do a little research. You shouldn’t patronize a breeder just because they have puppies available, especially if they do not use genetic testing. Knowledgeable breeders utilize genetic testing to prevent the passage of undesired traits or health conditions. Without this kind of testing, your puppy’s parents could be carriers of diseases that may manifest in your puppy later on. Additionally, it’s important that a breeder keeps all of their dogs healthy and in the best possible environment. You wouldn’t want to pay good money for a sick or malnourished puppy, nor would you want to give money to someone who mistreats animals. As a relatively new designer breed, Labrakita puppies may be hard to come by. This may mean that if you do find some for sale that they’ll be a bit pricey. Their price may also be influenced by the value of the parents, how many puppies are available, and whether or not they’ve received lots of veterinary attention before being placed for adoption. Since it may be hard to find an Akita Lab mix at a breeder’s, you may wish to consider looking for one at a humane society or animal shelter. You may not get a puppy there, unless it was surrendered from a puppy mill or other bad situation, but this could be a good thing if you specifically want a full-grown Labrakita. A good place to start looking might be at a Labrador- or Akita-specific rescue. Breed-specific rescues often take in mixes of their primary-focus breed. Some folks believe that mixed-breed dogs are unhealthy and/or inbred, but both of these convictions are false. Healthy puppies, regardless of their lineage, are produced when you breed only unrelated dogs that have been genetically tested and are confirmed to not carry undesirable genes. It’s actually inbreeding and back-breeding that causes health problems in all dogs. 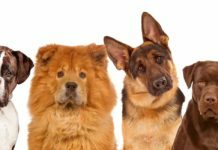 This article explains how specific breed combinations and creating future generations using dogs from separate families produce the healthiest hybrid offspring. The bottom line is continuing to breed related dogs, or dogs with known health issues, may result in the enhanced risk of unhealthy offspring. Depending on your household, an Akita Lab mix dog may or may not do well with you. They’re good-sized dogs once mature, so they need plenty of enclosed room to move. They won’t do well off a leash, thanks to their prey drive and possible aggression toward other dogs—another thing to keep in mind if you already have other pets. They have thick double-coats that will require minimal upkeep and will shed profusely seasonally. 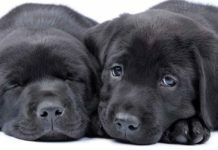 Genetic testing may be able to identify some of the health conditions that may be passed from the Labrakita’s parent breeds. 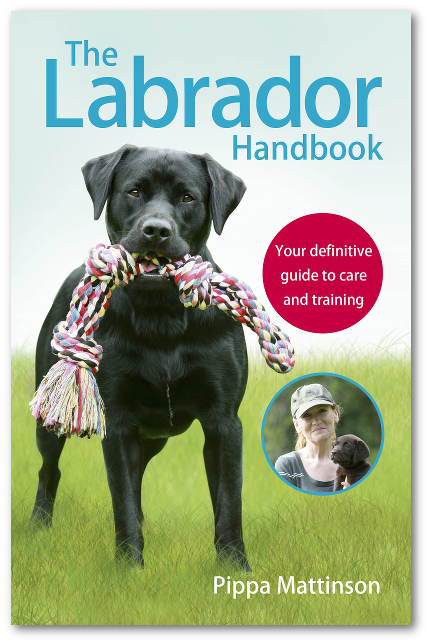 We hope this guide will help you make the right decision about whether or not a Labrakita is right for you.